The moment Jim and Cindy Mininni met one another, they fell in love and were inseparable for the past 24 years. 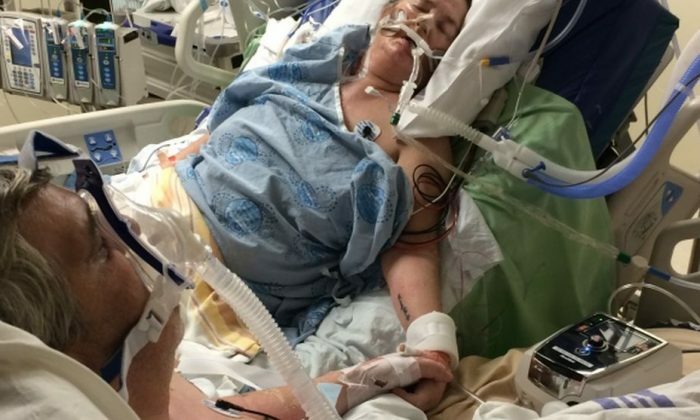 A photo of the two, both on life support, was captured by their son, Christopher, showing the two holding hands. Jim Mininni was admitted to the ICU late last month. The next day, Cindy suddenly suffered a heart attack and was also placed on life support. Both were sent to different hospitals, and Chris spent days running between the two, waiting for his parents’ respective prognoses. There, he was able to snap a photo of the two together just hours before his father died. His father had battled lung cancer for the past decade and had a large tumor blocking his airway. “He said, ‘If you can’t save me, don’t prolong my life,'” Chris told the magazine. “Because of his own wishes we couldn’t put it back in,” he added, referring to the breathing tube. Cindy, all the while, was sedated in a room near her husband. After doctors told Jim he’d be able to see Cindy, he “started bawling and saying thank you by doing the praying motion,” Chris said. Jim was then wheeled into his wife’s room and got to say goodbye. He was able to hold her hand and cry. Cindy has no recollection of the moment, and she is making a full recovery. Chris said he posted the photo on Reddit, and the response has been overwhelming. He told News.com.au: “I will never ever regret posting the photo. I understand people might be thinking I’m trying to get internet points but it was more about sharing a beautiful moment.